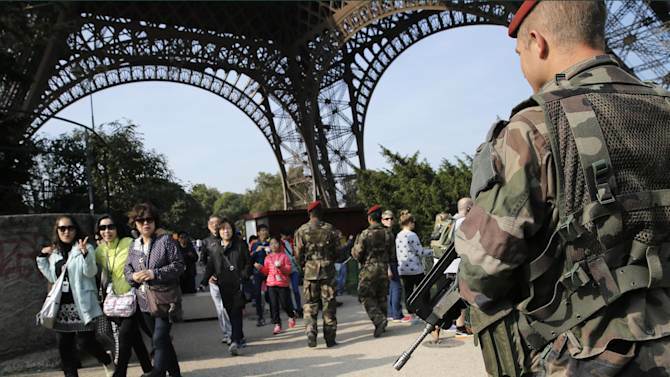 PARIS (AP) — The Islamic State group’s call on Muslims to go after the “filthy French” and other Westerners multiplies already deep security concerns in nations targeting the militant organization. The appeal made public Monday makes intelligence tracking of potential suspects virtually impossible and opens up Muslims in the West to the possibility of being unfairly put under suspicion or stigmatized. This entry was posted in Defense, Europe, Islamic State (ISIS), US and tagged France, Iraq, Islam, Islamic State group, Muslim, Paris, Syria, Western world. In ordering hundreds of military advisors to Iraq and dramatically ramping up intelligence-gathering on jihadist fighters threatening Baghdad, President Barack Obama sent his strongest signal yet that U.S. airstrikes against the Islamic State of Iraq and al-Sham (ISIS) may be likely. Since ISIS fighters took control of two key Iraqi cities last week, the U.S. military and intelligence agencies have blanketed portions of the country with spy satellites and drones, giving them what one senior administration official called “round-the-clock coverage” of locations where ISIS is active. The military personnel headed to Iraq — as many as 300, Obama said — will work alongside Iraqi military forces in special intelligence centers, using drone video feeds and spy satellite photographs to track and attack ISIS fighters. They’ll also be in a prime position to help carry out U.S. airstrikes the moment Obama orders them. This entry was posted in Iraq, Military, US and tagged Barack Obama, Iraq, Iraqi, ISI, Islamic State of Iraq, Obama, Pentagon, United States. The government has new plan to ensure that your seat belts are fastened, seats are in the upright position — and no one is hacking your plane. America’s security and intelligence agencies are teaming up with airline manufacturers to defend against a catastrophic cyberattack that could cripple the air traffic control system, interfere with the computer systems used by modern aircraft, and potentially even bring down a plane. This entry was posted in Security, Technology, Terrorism, US and tagged Boeing, Director of National Intelligence, National Security Agency, TSA, United States, Washington. Police respond to the scene of a shooting rampage at Washington Navy Yard that left 12 victims dead on Sept. 16, 2013. Secretary of Defense Chuck Hagel and Secretary of the Navy Ray Mabus deliver remarks during a press conference at the Pentagon March 18, 2014. Hagel and Mabus addressed the implementation plans resulting from the Washington Navy Yard shooting investigations and reviews. Aaron Alexis killed 12 people in last year’s rampage at Washington’s Navy Yard. Alexis lied so convincingly to Veterans Affairs doctors before the shootings that they concluded he had no mental health issues, according to a review of his confidential medical files. WASHINGTON — The Defense Department issued new directives Tuesday to try to mitigate the “insider threat” to DOD personnel and facilities, based on the findings of three reviews of last year’s Navy Yard shooting. This entry was posted in Defense, Military, Security, US and tagged Alexis, Chuck Hagel, Defense Department, Hagel, Pentagon, Security clearance, United States Department of Defense, Washington Navy Yard.